A number of the visits we undertook during our holiday seemed to have developed an ecclesiastical theme. But this may not be a surprise when you remember that so many of the towns, villages and hamlets in Wales start with Llan. That said how about this for a miraculous tale and how the church has turned a mystery into a money making enterprise that continues today. Unlike many of the wells that we’ve visited or will visit in the future in Wales this is very much an organised enterprise. You can only access and exit the well through a gift shop, very reminiscent of so many Catholic shrines abroad. The main well where the water enters the shrine. First let’s go to the legend, and I love a story, some of which may be based on truth especially the most basic instincts involved, but the rest can only be an allegory for rebirth. The daughter of a local rich Nobel man, Gwenffrwd (St Winifred) had chosen to devote her life to the service of God. Caradoc, the son of a local chief, had long been attracted to her beauty, called to the house asking for water while her parents were out. But wanting more he pressed his attention on Gwenffrwd. However, having de opted herself to God she rejected his advances, angry at being turned down he attacked her and started to tear away her clothes. She fled towards her uncle’s (St Beuno) church, hoping that he would be able to aid her, but Prince Caradoc was quicker and caught her on a hillside. Winifred fought back, so Caradoc, in a fit of rage beheaded her with his sword (1). St Beuno had been insider is church nearby church and came outside to find Winifred’s decapitated body and with Caradoc standing over her with his bloody sword. St Beuno cursed Caradoc, who immediately died and melted away. As St Beuno picked up her head in grief, a spring welled up from the ground at the spot where Winifred had fallen. St Beuno replaced St Winifreds head on her neck, and after a short prayer the wound was healed and the young woman was resurrected, leaving only a slight scar. Red marked stones at the bottom of the well are said to be stained with blood of St Winifred. She then went on be an influential figure in the early church in Wales. The pool where people bath. water enters the pool from the well head in the shrine. St. Winifred was a local Welsh saint of little importance until her relics were translated, in 1136, to a magnificent shrine in Shrewsbury Abbey. Then two years later Prior Robert of Shrewsbury wrote a history of her life and devotion. Her original tomb was retained at Gwytherin and St. Winifred’s Well. The well has been a pilgrimage destination for centuries, including a number of monarchs. 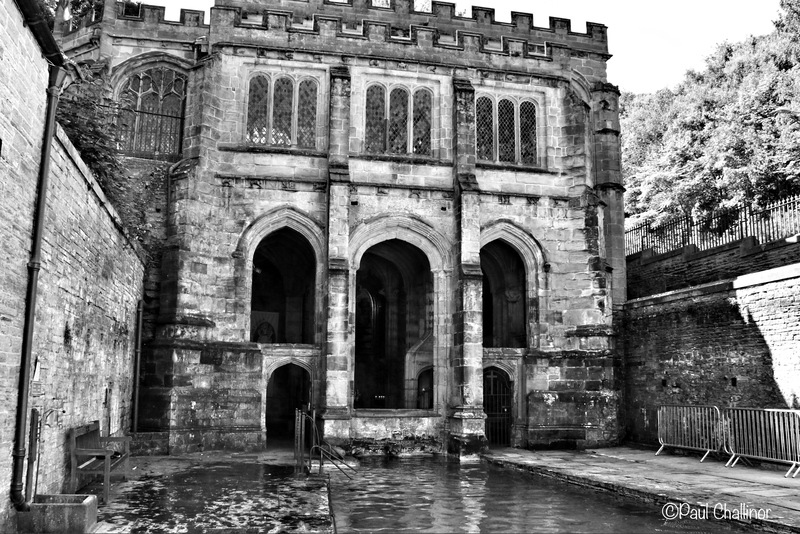 In 1189 Richard I, the Lionheart, made a pilgrimage to the Well. Then in 1416 Henry V paid a thanks giving visit following his victory at Agincourt, walk from Shresbury to St Winefride’s Well. According to the Welsh poet Tudor Aled, Edward IV came on pilgrimage in 1461 , when he placed a pinch of earth taken from beside the Well upon his crown. The believe and dedication continued when in 1686 James II and Queen Mary Beatrice came on pilgrimage to pray for an heir; according to Thomas Pennant the Jesuits then in charge of the Well presented the King with a present of the very shift worn by his Great Grand Mother Mary Stuart was wearing when she lost her head! Strange how they still had, and were then able to give back when James II visited. Detail showing the complicated dome over the well head, supporting thechapel above. Early in the 20th century the well dried up due to mining on Halkyn Mountain as the water was diverted. The well today is fed by the local water utilities so it will not have the same mineral properties as the early pilgrims would have taken advantage of. 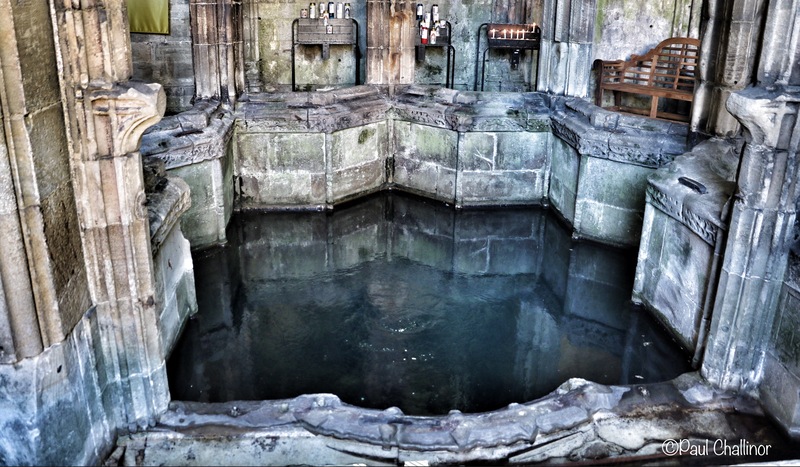 The healing waters of St Winifred’s (Winifride) Holy Well have attracted pilgrims for over 1300 years and the crypt in which the well lies was stacked with crutches left by the cured invalids until some time in the 1960’s, though can still be seen on display. In order to effect cure for whatever ailment should be troubling you, the pilgrim should enter the water three times for the cure to be effective although even this process does not necessarily guarantee success. Now I only have a slightly dogy knee but the water was very cold and I only managed to tolerate entering the pool twice. When I say cold, believe me it was! I think I’ll stick to more pragmatic methods that will be more beneficial to me. Today around 3600 visitors have been recorded and the numbers have been said to be increasing significantly (2).